In recent years, mostly thanks to a seemingly endless stream of single-menu restaurant openings – lobster has become extremely popular in London, and relatively accessible. Once reserved almost exclusively for flaunting wealth and ordering the most expensive single dish on a restaurant’s menu just in order to appear sophisticated and knowledgeable. Now it’s 2016 and there are countless establishments that offer whole, equitably sized lobsters for less than £20. The newfound availability is brilliant, of course, but with such a price certain issues regularly occur; namely the serving of lobster that is either cold, or has been so overcooked that eating becomes a chore, with tough tail and claw meat that’s harder to chew through than an orthopaedic boot sole. What’s more, in order to eat whole lobster with ease a whole kit of tools is generally necessary – alas rather than providing the correct utensils, chefs feel, all-to-often, that they’re being helpful by discarding the tastiest part of the dish. However, the biggest issue that’s arisen from the popularity of lobster is the sheer fact that everybody seems to have forgotten the crab – king of crustaceans. Primarily, crab has always been more affordable, and while lobster is richer and more luxurious, crab has a sweetness and depth of flavour that’s far superior, in most cases – especially within the less popular brown meat that’s discarded far less than the aesthetically unattractive parts of lobster. 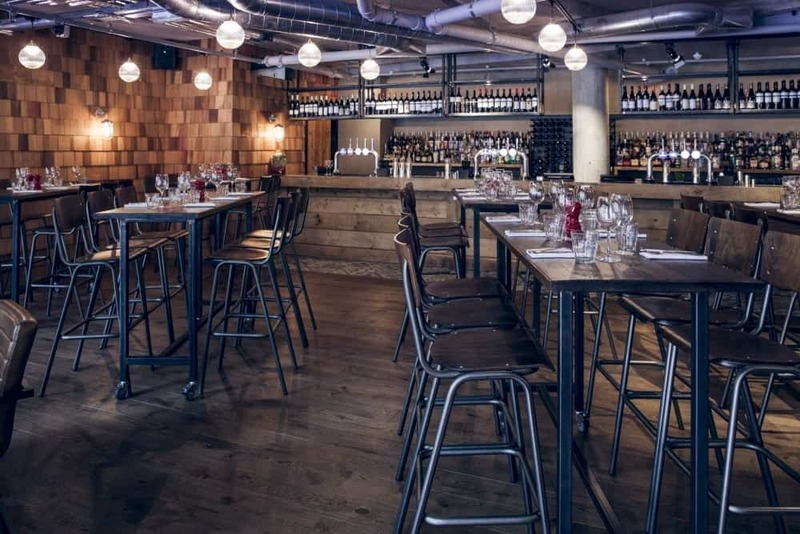 One restaurant that hasn’t forgotten the humble crab, nonetheless, is Crab Tavern – a relatively new opening within Broadgate Circle, just behind Liverpool Street Station, joining the likes of Franco Manca, Street Kitchen, and Yauatcha. Opened as the first London venture from Russian restaurateur Igor Krayushkin the restaurant is heavily inspired by American seafood restaurants and has a menu that’s specifically, although not limited to, in favour of crab. Inside, the vast 150-cover space is punctuated by a colourful feature wall of cartoon crabs that add some warmth to the space, bedecked with bare brick walls, rough wood and an industrial edge that lends a firm nod to New York, and isn’t dissimilar to what’s expected from the likes of Big Easy, here in London. Alongside an extensive menu, with plenty of crab dishes (obviously) there’s also an impressive spirit-lined bar that specialises in signature ‘Crabtini’ cocktails, comprised of two of my least favourite ingredients – vodka and violet – combined with rhubarb. Surprisingly the combination works very well, especially as an aperitif that leads into an onslaught of seafood dishes. To start, we opted for a ‘crab taster’ sharing platter that featured crab prepared in various manners. Lightly battered and fried soft-shell crab was a highlight, with a welcome lack of grease, though it’s the crab sub roll that was most pleasurable. Featuring cold crab meat bursting from a buttery brioche bun, tasting far better than the famous lobster roll that’s on offer at Burger & Lobster – so good in fact, that if it had been available as a larger main course, I’d have cancelled my order and sampled it it again, at least once more. Alas, crab tartare, which featured shredded mounds of white meat lacked flavour and was generally unremarkable, lacking the vigour that even the slenderest squeeze of lemon would have cured. Next, another sharing dish – Crab Tavern’s gargantuan West Coast Bucket Boil landed at the table, vast enough for at least one more diner to have joined us. Almost overflowing with goodness, spicy Merguez sausage was joined by various seafood favourites such as crab, mussels and lobster – all of which had been properly cooked and sustained impressive heat retention. All of this was joined by lashings of a buttery sauce and boiled ratte potatoes, a plate of bread and chunks of golden corn cobbettes. Apart from the overwhelming portion size, what’s most memorable about the dish is the fact that all of the correct utensils were offered in order to get the absolute most from the shellfish, joined by finger bowls and plastic aprons, encouraging diners to tackle the dish without cutlery and an inelegance that’s often frowned upon in many restaurants. To finish, a slab of cheesecake was adequate yet unremarkable, meanwhile a peanut butter and jelly waffle provided a welcome finale. A necessarily meagre portion comprised a warm Belgian waffle topped with sharp raspberry jam and an absolutely inspired peanut butter ice cream, topped with flaked peanuts to add the most desirable crunchiness – as peanut butter always should be. Overall, the dining experience at Crab Tavern is remarkably enjoyable. Although a little pricey, the majority of the food here isn’t fine dining, by any stretch of the term – but there’s a real charm and appeal that comes with this casual, fun, American-inspired soul food that makes for a particularly refreshing addition to this part of the city’s dining scene. Crab Tavern can be found at 7 Broadgate Circle, London, EC2M 2QS.